Hey – Happy New Year! I can’t believe another year just flew by. So, are you thinking about what you want to accomplish in this upcoming year? Is there something you want to learn? Is there something BIG you want to work towards? Any new projects? Or maybe you just want to take another step toward living a more farm-fresh or healthier lifestyle? Well, I’m thinking about those sorts of things too. But…here’s what I DON’T do. I never write down New Year’s Resolutions. Nope. The task of writing a random “to-do” list of what I “wish” to accomplish has just never worked for me. When I have done that in the past, I rarely take action. I think it’s because a random list always feels like pipe dreams with no meat behind them. You know what I mean? So a few years ago, I took a few business productivity classes and learned different techniques for setting and reaching business goals. And then I adapted those standard techniques for accomplishing my homesteading goals (gardening, food-crafting) and personal/health goals. Goal setting is VERY different from writing down New Year’s Resolutions. Goal setting means, you push yourself a little out of your comfort zone and make those goals REAL! And you analyze your goals a bit before doing that to be sure they are realist and attainable. In other words, you set yourself up for success instead of failure. Then…you set out making them happen…in a very strategic way. You can use these methods to accomplish ANY goals including things like losing weight or getting a more healthy lifestyle. Anything. Since changing my mindset , I have been reaching more of my goals. (Not every, single one…But most.) And since implementing real goal setting systems, I even sometimes change my goals mid-year (with NO guilt). That’s totally allowed! The goal setting techniques I use are not always perfect. But man…I get a lot more of my goals met than I used to. In this week’s podcast, I dive deep into the step-by-step method I use to set my goals. And I teach you how you can try it to reach whatever goals you might have swimming around in your head. To get the full details, you can listen to the podcast episode (click the audio link at the top of the page) or you can read the transcript (below). Or you can read through a summary I outline below of the 6 steps I use. 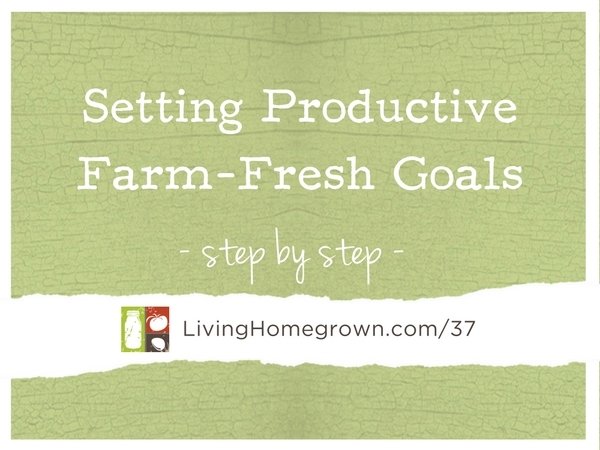 To help you reach YOUR homesteading or personal goals, I created a free downloadable Goal Setting Worksheet to help walk you through the process. I hope you find this worksheet really valuable because I want you to reach for the stars AND get there this year! Also within the worksheet, I have included some free on-line tools I like to use (not mentioned in the episode). I think these tools will really help you with setting and reaching your goals. If you have some goals that are really important to you, then take the time to fill out the worksheet. If you do, then you are well on your way to attaining that goal. In fact, doing this puts you 90% ahead of what most people do with goal setting! Let’s make 2016 the best year ever! If you are like me, you have a million ideas of what you might like to do this year swimming around in your head. Am I right? Get those ideas out of your head and onto paper (or your computer). Seriously! Write them down…ALL of them. By writing them all down, you clear your mind of clutter and you will stop worrying about forgetting something important. So always do this first. You have to realize that you probably can’t reach ALL of these listed goals in a year. So pick which ones are most important to you. And break those goals down by quarter. Be sure to start with just 3-6 goals you will work on this first quarter. Why by quarter? And since you wrote them all down, you won’t forget the rest. You can always come back to your list later. Use the popular SMART Goal Setting Method for writing out your goals. 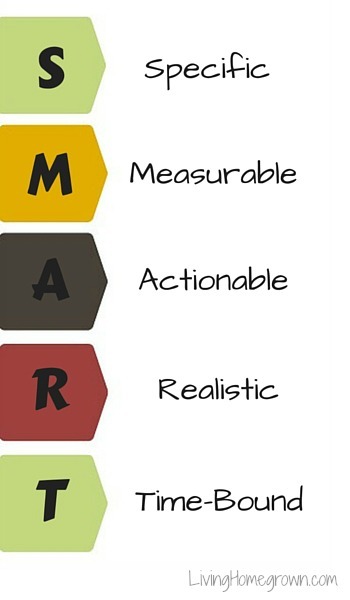 SMART is an acronym for: Specific, Measurable, Actionable, Realistic and Time-Bound. By writing out your goals using each of those attributes, you make them REAL and push yourself with a deadline. Example: I want to learn how to make ricotta and mozzarella…. Measurable: You need to know when you reach that goal, so use numbers if possible. Actionable: Instead of saying something like I want to “be” more sustainable. Use action words like Learn, Gain, Lose, Create, Prepare, Develop, Reduce, etc. Example: I want to reduce our home waste by 25%…. Example: “I want to install solar panels by September 1st”. That one step toward being completely off grid has time built in so you can learn, research and implement. Time-Bound: Set a date – a solid date for every goal. This puts a little pressure on you so you don’t blow it off. It also sets your mind up to figure out the steps needed to reach that goal by that date. Determine your reasons or your purpose in wanting this goal. Why do you want this for yourself? Figuring out WHY you want this goal is important because when the going gets tough (and it sometimes does), you can refer to this list to keep you motivated. All you do is write down ALL the reasons you want this goal and keep it handy. Take each goal and write out exactly what needs to happen to make that goal inevitable. In other words, if you do those tasks it WILL happen. That list becomes your to-dos or your tasks. You now have a very real, actionable list of goals and each goal has a list of tasks that need to happen to make that goal a reality. The next step is to write the first 1-3 tasks onto your calendar. Make it real and schedule it to make it happen. And also schedule time (30-60 min) at the end of each quarter (or season) to reassess your goals and where you are in reaching them. It’s okay to shift gears. These are YOUR goals. So don’t guilt yourself out if you need to make adjustments. Okay – download the free worksheet, (Some resources are included in the PDF) and write down/organize what you plan to accomplish this year. Thanks Theresa for your goal-setting podcast! I admit, this is one of my weaknesses. One goal I’m setting for myself is to learn to use my greenhouse year-round instead of Spring-Summer by Fall of 2016, so I’m set-up for the next winter. That’s a GREAT goal Paula! That will make you super productive. I can’t wait to hear what you have in store for this year’s podcast topics, Theresa! I’m wondering if you will be featuring the author of Year-Round Indoor Salad Gardening (Peter Burke). I heard him speak recently and tried out his method of growing soil sprouts. I’m totally loving it! Ten days after receiving his book I have already harvested my first crop of a variety of indoor grown salad greens/soil sprouts! So easy – just amazing! That is SO funny that you asked that Jodie. I am reviewing his book now. I have blog post coming up about his book. No plans for him to be on the podcast, but if you are subscriber to my newsletter (just opt in anywhere on my site for my canning resource guide), then you will be notified when the post comes out. I am happy to hear his methods are keeping you in a fresh supply of greens!